We are on a roll… as soon as we started folding paper versions of our favorite Gingerbread things like Gingerbread Men and Gingerbread Houses, we keep finding more options. This one is an inexpensive iPad app called Foldify. 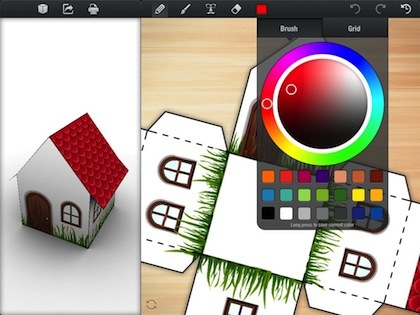 The app lets you paint onto flattened creative areas, then print, cut out, and fold. The tabs need to be glued or taped, but the cutting is simple so the whole family can join in the fun. Each shape starts as a blank template which can be twisted and zoomed in to get maximum creative area to work in. Choose a drawing tool, then pick a color from either the color circle or the quick picker, then start drawing! On the left, you can see a 3D version of what your design will look like when printed and folded. Foldify lets you turn the 3D image too so you can see how things are going from every angle. Then, print in three different sizes, email a PDF version or even post to a few social network options. 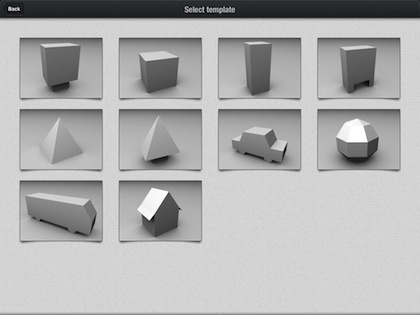 Foldify provides a nice selection of shape templates included. Each family member can create their own Gingerbread house, put a few trees around (remember, each item can be printed in 3 different sizes), have Gingerbread family members walking around and even a snowman! The shapes are not multi-cubes having to be put together like one of our earlier posts so things like arm are drawn on the sides of the ‘people’ templates. There is plenty of eyes, noses, candy cane and other ‘stamps’ to apply so don’t worry about having limited drawing skills. Personalize to make each one truly your own. There is no limit to how many Gingerbread Houses and things you can create and print so everyone can keep expanding their Village beyond the fireplace mantel to all around the house (and offices). 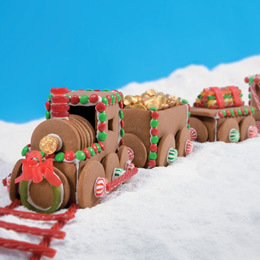 Make way for the Gingerbread Train coming through – Step by Step make your own! Gingerbread isn’t ‘just’ for houses and little people! Our favorite cookie can be cut to make just about anything. And today, we bring you a great step-by-step set of instruction to build a whole train. The instructions on the site include the parts/shapes you need to cut out, how to frosting them together and what the many train parts may look like. Even downloadable PDF templates to really make the shape cutting easy! You can customize as you like… just add a couple little highlights using bits of candy and colored frosting and a caboose could become a Santa Caboose or a engine is run by little figures of all of the family. 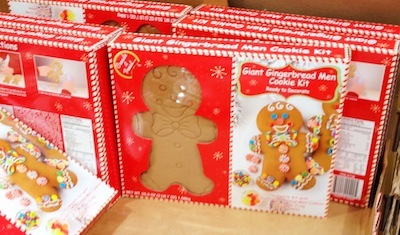 It’s simple projects like these that lets everyone create Gingerbread Holiday fun then add their personal touches. Years ago, we found a site that let us have fun building Gingerbread Houses online. The site has gotten a bit outdated, which has resulted in email from our many visitors asking about new options. Luckily, this week we found another page that is helping us put together all kinds of ideas for new Gingerbread houses. Starting with a clean house with a bit of frosting, just click and drag one of the many candy choices from the lower part of the screen up the house. The candies can be moved around as you like, they aren’t stuck where they are placed originally. 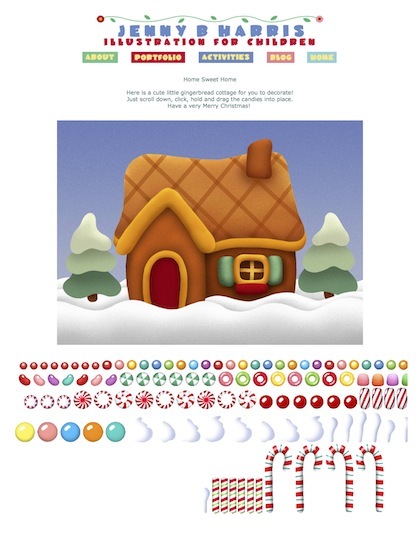 When the virtual Gingerbread House is they way you like it, share with others by taking a screen shot or printing the page. 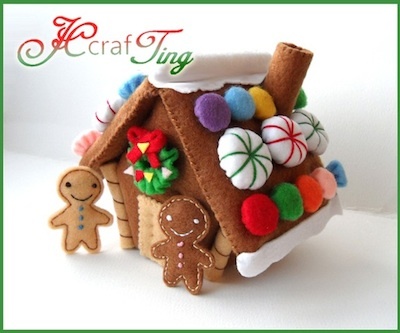 Jump over to the Home Sweet Home page to start pasting candies onto your Gingerbread house. Looking around for new Gingerbread House plans, we came across a few that needed no cooking. Gingerbread Houses made from felt. The plans are delivered via email as a PDF so they are in your hands right away and only 6 dollar US (pricing we saw on 12/19/2011). Of course, you need to have the felt. The nice thing about felt Gingerbread Houses though is they are quick to make, no cooking is required and felt lasts forever… though, it doesn’t taste as good as their Gingerbread cookie versions. We mentioned there is a lot of fun stuff for the Gingerbread Fan over on Etsy. When we came across this one, we just had to share. It reminds us that there is a lot of fun to be had in putting together a Gingerbread House. It isn’t just four walls, a roof and some icing. You can add things that personalize it to your family or to theme that everyone knows. 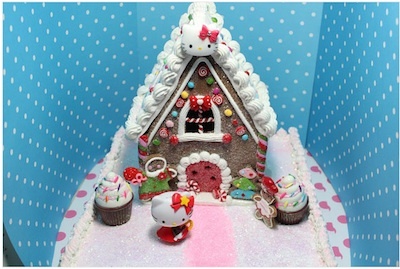 In this case, the creation is around the love of Hello Kitty. 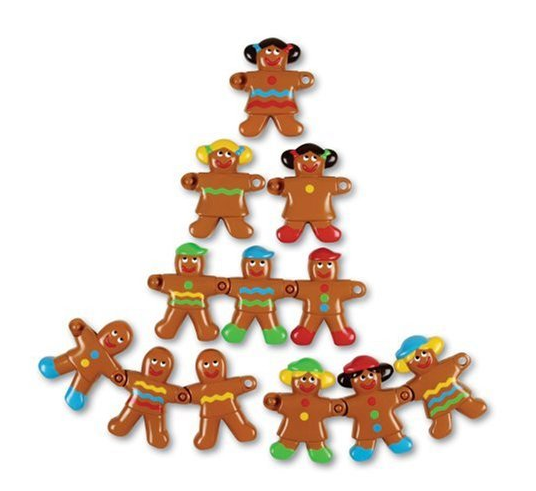 You can have a Gingerbread person to represent each person in the family. Or maybe let everyone make their face in a window using a icing tube to draw with. Different colors of icing not he walls of the house can take a brown house to a colorful one that resembles a building everyone had a good time at over the last vacation. There is fun in making a Gingerbread House that is like the ones over the years and there is fun in customizing the look to something unique to your family. Most important, it’s family fun! Walking through Costco this weekend, we saw they still had a few Gingerbread House kits in stock… we posted pics of those before. But, a new addition, where these giant Gingerbread Men. Sorry for the quick snap being a bit blurry, it’s frantic there with so many people and everyone grabbing anything that doesn’t move. These guys aren’t found on the Costco Web site so they may also be limited to which stores they are in. Question, does each kid and parent get their own to work on all day or do we do one per family and have everyone take a part? Either way, they will be a lot of fun at this weekend’s get together. Gingerbread doesn’t have to be only for the holiday time of the year. It can be enjoyed year round. We’re with you though, it does seem to taste better when the holidays and cool weather roll in. 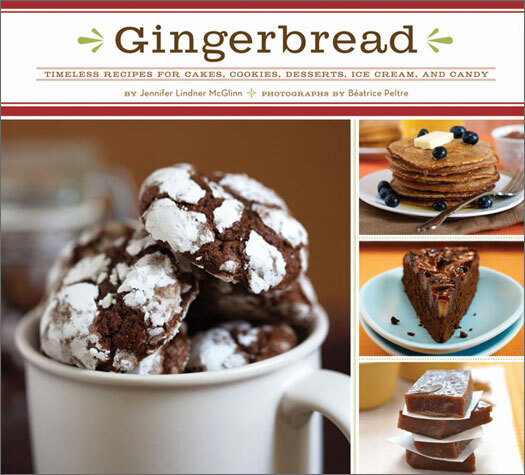 A fun ‘Gingerbread’ book we happened upon looks like it might have use looking to summer and winter dishes to enjoy our love of Gingerbread. We found this over on the Kobo site, if you have a Kobo Reader or have installed the free Kobo app on your desktop or iPad/iPhone this is a great way to enjoy the book anytime. The print version of the book is available on Amazon. This might be a book that is best enjoyed by the whole family gathered around the paper pages. No, don’t use your iPad as a serving tray or a plate for your cookies in the oven. 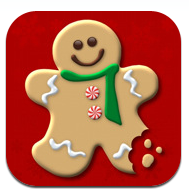 This is more about having fun making ‘digital’ cookies on your iPad or iPhone. The application available through the iTunes app store is ‘Cookie Doodle‘. With the app, you choose your dough, roll it out, choose the cookie cutter, bake and then decorate to make them ‘your’ creations. Your cookies can be saved as an image or sent out with an email right from your iPad and iPhone. One cookie doesn’t say what you want to say? 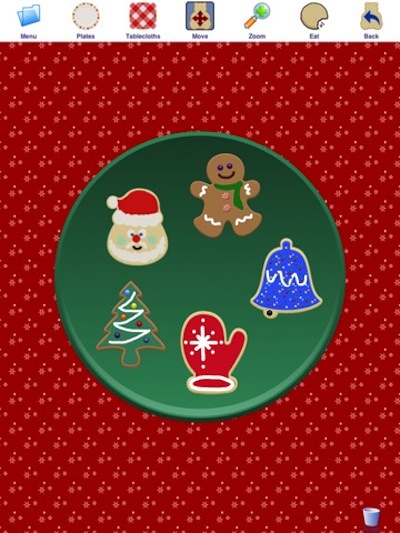 You can create a plate of cookies to share, giving you more oportunities to show your Gingerbread decorating creative side. 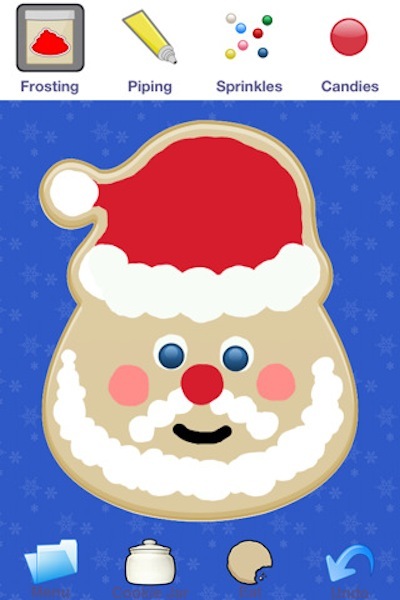 Grab your copy of Cookie Doodle for a bit of family fun too, there is no charge to make endless number of cookies after the initial 99 cents for the app. I wish I had seen this before I did so many cookies last weekend. Instead of just an outline of a Gingerbread Man to cut cookies, these from Hammer Song cut a cute little guy that includes a little heart. What a way of saying Happy Holidays with Love! 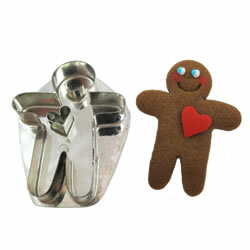 The cutter is tin and makes a 2 inch tall, 1 1/2 inch wide little Ginberbread Man. If your not familier with Hammer Song cutters, they are hand crafted cutters designed by a couple in America. 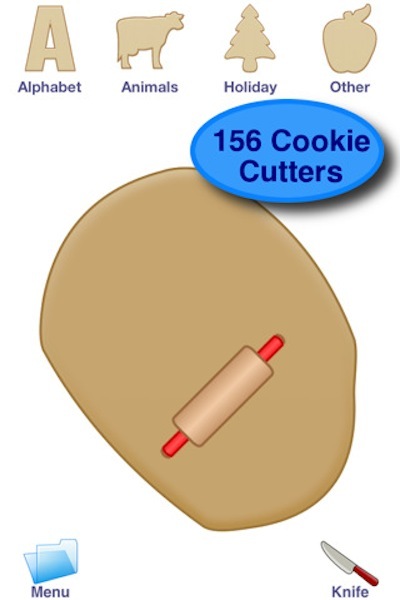 What I have loved using their cutters in the past is that the cookies look just a little different from what everyone else has so you give out unique cookies that people know you made without looking, er… homemade. Fancy Flours is offering these cutters for sale along with instructions on how to make the perfect Gingerbread Man cookies using these cutters.